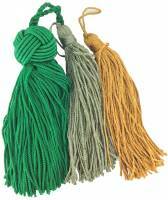 Description: 4" & 4-1/2" tassels in discontinued & current colors (no choice). Imported. Description: For door keys. Rayon. 4” long with fancy knotted top. Burgundy. Taiwan. Combine with other tassels for price breaks. Key not included. Description: For door keys. Rayon. 4” long with fancy knotted top. Dark Red. Taiwan. Combine with other tassels for price breaks. Key not included. Description: For door keys. Rayon. 4” long with fancy knotted top. Forest Green. Taiwan. Combine with other tassels for price breaks. Key not included. Description: For door keys. Black rayon tassel is 4" long with a fancy knotted top. Made in Taiwan. Combine with other tassels for price breaks. Key not included. Description: For door keys. Rayon. 4” long with fancy knotted top. Gold. Taiwan. Combine with other tassels for price breaks. Key not included. Description: For door keys. Rayon. 4” long with fancy knotted top. Navy. Taiwan. Combine with other tassels for price breaks. Key not included. Description: Colorful oyster (ivory) rayon tassel is 4" long with a fancy knotted top. Made in Taiwan. Combine with other tassels for price breaks. Key not included.